The other day I read a post that my friend Justin wrote, entitled What I learned from Chris Lema. I was inspired by his post to write a version of my own about the things I’ve learned from Chris Brogan. I’ve been in a course he runs called Blogging: The Master Class for the last year. It’s actually in it’s second version, which is even better. Now, I’m not to summarize all of the lessons in the course, but I do want to highlight some of what I’ve picked up and why I think you should consider, seriously consider, taking the class. Why talk about a blogging class at all, you might wonder. Is it because I blog daily and want you to do the same? No, not really. But I do think it’s important to understand the role that Google has in your own brand development. There was a time when you had a resume and it was the way people evaluated you. Today people just look you up in Google’s search engine. So it makes sense that you think about your brand development in the context of Google. And if you’re working on your brand development, it makes sense to keep Google happy. Know the best way? Fresh content. Valuable content. I’m not saying you have to blog daily, but I am saying that Google will send 5x more traffic your way when you post more than 20 times a month, than when you post 4 times a month. So there’s that. So what did I learn? Well here are five things I learned from Chris that you could learn, in depth, in his revised Blogging: The Master Class course. Just do it. It’s more about habits than anything else. Blogging is a discipline. When you write, put yourself into your writing. This isn’t academic research. Stories are powerful ways to wrap facts and critical messages. Use them. Using a conversational tone & writing to one person is powerful. Do it. Stop wasting time. Monitor how much tv you watch. You’ll be sad. Now those are all really great lessons, and I think the class is worth it on that alone. But let me push you even further. The community that he’s created isn’t just a bunch of students all turning in homework. They’re your peer advisors. And I can’t tell you how powerful that is. Because it creates a community that is constantly helping you, encouraging you, and challenging you. That alone is worth the price. Every now and then I release results of the traffic on my site. This says more about Google than it does me, as it’s the one sending the traffic. But if you look, you’ll see that the lessons work. They’re rock solid, and if you do the work, I think you’ll see the same results. A year ago, I got about 2300 views in the month. These days that’s less than a single day. 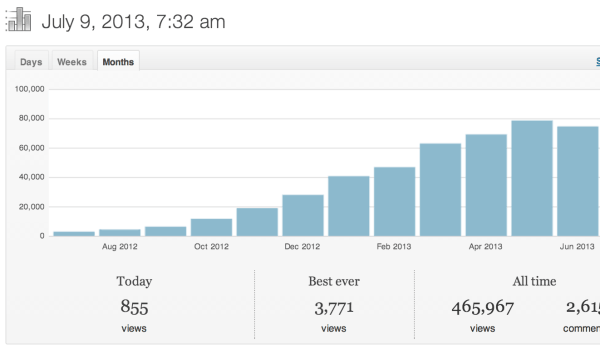 So I’m getting more than 30 times more traffic now than before I took Chris’ class. It just works. What you see is that the diligent work of daily posting creates between 75 and 80 thousand page views a month these days. That’s not nothing – especially when there’s not much else on the site except blog posts. So what are you waiting for – you could learn directly from Chris Brogan too!